The Crew has reviewed Logic of English in the past but I've always hesitated about requesting to review Foundations Level A. It isn't that I didn't think it would be amazing. It's me. It's my daughter. 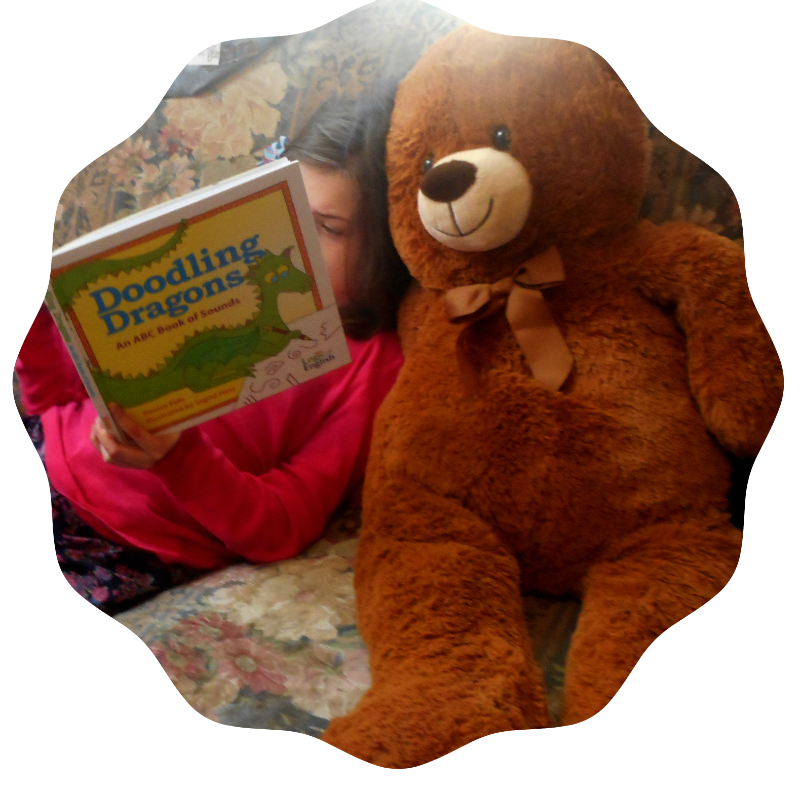 She has skills all over the place and I wasn't sure that starting at the beginning of yet another homeschool reading curriculum would be in our best interest. I knew she wasn't really ready for Level B and since she hadn't used Foundations Level A, Foundations Level B wasn't really an option. So why did I change my mind? Why did I decide that I did want to give this program a try even though it would mean starting at the beginning when she is already reading CVC and CCVC words? Why would would I want to start at the beginning when she already knows all the short vowel sounds and long vowel sounds and some phonograms like th, sh, ck, and ch? Because Foundations Level A is different. I know that my daughter has asynchronous skills. I know that she struggles with forming certain sounds. I know she struggles with letter placement when forming her letters. I wanted to start with Foundations Level A because I want Supergirl to fill in the gaps in her skills and gain confidence in her budding ability to read fluently with comprehension. I want to start with an overview of everything I received. Some of the items are specific to Foundations A and others are reusable and will be used throughout Foundations. Yes, there are many parts to it and it may seem overwhelming when you open the box and keep pulling things out but the Teacher Manual has everything so well laid out that you do not have to stress out about when you need which item. My bigger issue has been trying to find a storage system that works for me. Scope and Sequence ~ shows what skills are covered in Phonemic Awareness, Handwriting, and Spelling for each lesson. 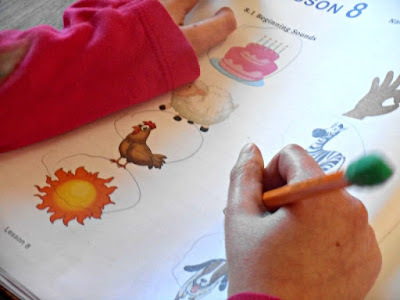 Common Core Standards ~ the first section groups the standards into sections such as Kindergarten Reading Foundational Skills, and Kindergarten Reading Informational Texts. One column describes the standard and another column lists which lessons in Foundations those skills are covered. The second section lists out each lesson in Foundations A and which standards are covered. Fully Scripted Lessons ~ yes, Ms Eide even tells you what to say! The paperback Student Workbook has perforated pages making them easy to tear out. 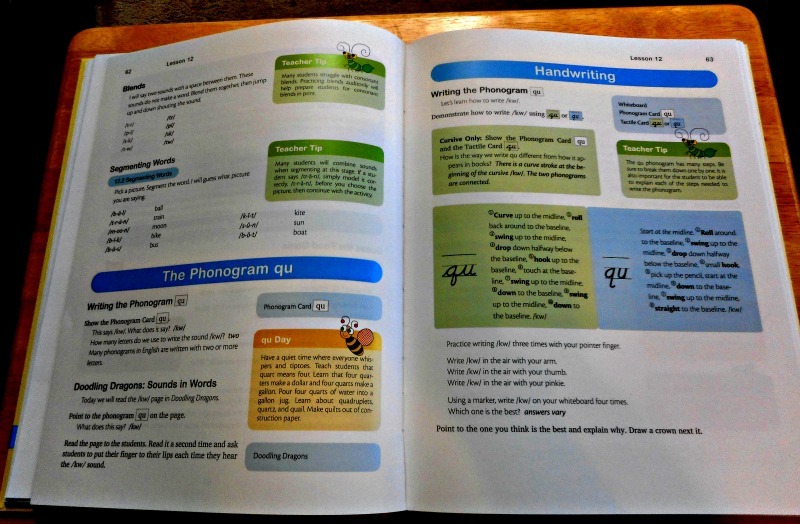 The workbook includes handwriting practice pages, phonemic awareness, reading practice, games, and 6 student readers. The student readers are located in the back of the workbook. The Teacher Manual will tell you when you need each reader. Because the workbook includes handwriting practice pages, you need to choose your workbook based on manuscript or cursive. Instructions for both manuscript and cursive are included in the Teacher Manual. I thought the best way to describe how thorough this program is is to walk through a lesson. Each lesson has a blue box at the top that lists the objectives for that lesson and the Materials. Materials are divided into Needed and Optional. This box provides a nice overview of the lesson. Every lesson begins with Phonemic Awareness. Sometimes the activities are listening for sounds. Sometimes the activities are blending sounds or words. Many lessons have an activity and a workbook page. Lesson 9, my sample lesson begins with a Beginning Sounds worksheet. The second activity is a Blending Treasure Hunt. The teacher segments a word, the student blends the segmented sounds into a word and then finds the object in the room. Note: Supergirl had this to say about the program and phonemic awareness acivities. "It's fun but it's hard." She struggles with blending the words that have 4 or more sounds. This is another example of why I am loving my decision to start with Foundations A. She is getting extra practice with listening to longer words segmented and blending them together. This is an auditory processing and auditory memory skill. The more bits of information you can hold in your mind, the stronger your ability to process and retain the information. A longer auditory memory span is a foundational skill for more than just reading. An average adult has a digit span of least 7. A digit span of at least 4-5 is necessary for reading phonetically. What does that mean? It means that your brain can hold 4-5 chunks of information long enough to blend those sounds into words. If a child only has an auditory digit span of 2-3 she will struggle with blending longer 4 and 5 sound words such as stop or stomp. This is something that I have seen with Supergirl and I can not say enough positive things about how these phonemic awareness sections are helping to strengthen her skills. 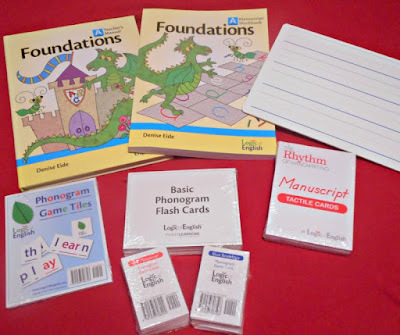 After working on phonemic awareness skills, the lesson introduces a new phonogram. Unlike past programs that I have used, Logic of English teaches all the sounds of that phonogram. For the letter C you learn both /k/ and /s/ sounds. I want to note that Denise Eide has a similar philosophy about teaching letter names. Knowing the name of the letter does not help a student learn how to read. Foundations A Teacher Manual instructs parent/teacher to refer to the phonogram by the sound(s) it represents and not by the letter name. I love that Supergirl is learning new sounds even though we're starting at the very beginning of a learn to read program. She's learning the third sound of a (as in Father) and learning both /g/ and /j/ for g.
The third section of a lesson is Handwriting. 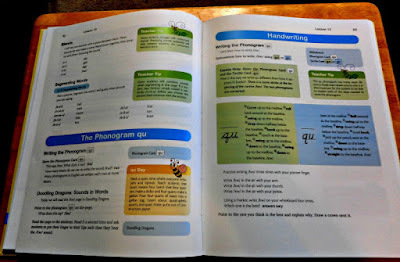 If a new phonogram has been introduced, then the handwriting lesson will focus on writing the phonogram. Earlier lessons begin by teaching the names of the lines: Top Line, Mid Line, Base Line. Basic strokes are taught first. I confess I was frustrated with trying to teach a stroke but now that we've mastered several strokes and a couple of phonograms that use those strokes, I see the logic in the Rhythm of Handwriting approach. I love that Supergirl is learning how to start at the mid-line roll to the base line swing to the mid-line and down to the base line to create the letter a. She's just learned the down swoop stroke this week and is applying it today in learning how to write g.
Starting with Lesson 9, a fourth section appears: Phonogram Practice. This section reviews past phonograms and builds fluency between the phonogram and the sounds. Some activities in the section help tie the written phonogram with the auditory sound it represents. 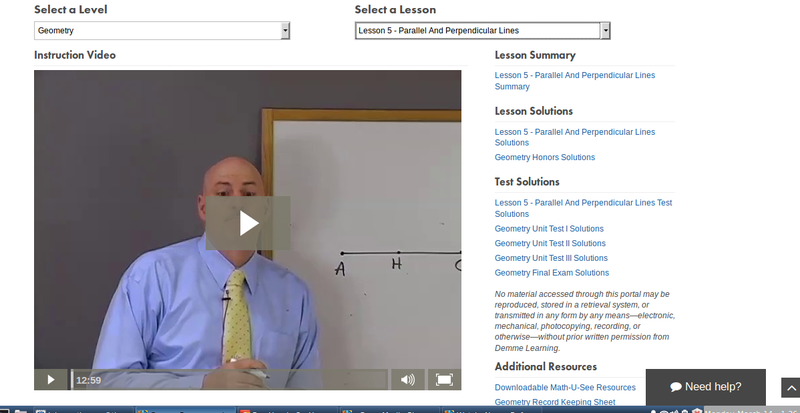 Two new sections are introduced in Lesson 21. Spelling and Reading. In these sections students are putting together the different skills they have learned. They start by reading and spelling words and then move on to reading phrases. The program includes 8 Review Lessons which also allow the parent to assess the student's skills. They also provide an opportunity for additional practice. This is a mastery program and the Teacher Manual will tell which skills need to be mastered before you move on to the next set of lessons. Skills are ranked 1, 2, or 3. Skills that are ranked a 1 need to be mastered. The student should be familiar with skills ranked a 2 but they will be working extensively with those skills in upcoming lessons so it is not necessary that they be mastered at that review. Level 3 skills are in the chart but not included in the assessments. They are not necessary for becoming strong readers but may be beneficial for some students. 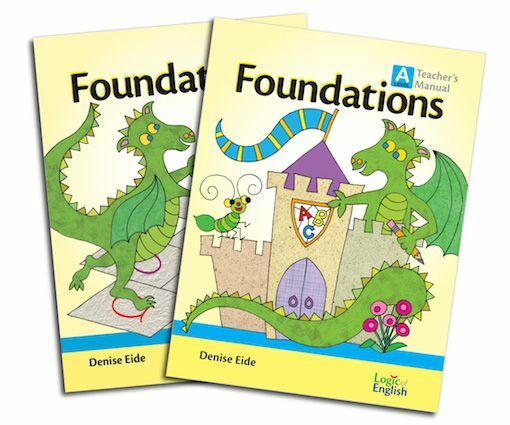 This is a very thorough and fun program that is aptly named Foundations. The Teacher Manual is sprinkled with lots of little color coded boxes that offer Speech Tips, Challenge, Teacher Tips, Multi-sensory fun. For kinesthetic learners and very wiggly-need-to-run-and-move young children this program offers lots physical movement. I found it easier to adapt for my daughter with physical challenges than I thought it would be. I was confused about the pacing of the program. I did not see pacing addressed the teacher guide. I started out with dividing up each lesson by section and completing one lesson a week. We've now sped up a bit but I do take 2 days to do a lesson. This allows me to repeat the phonemic awareness sections for extra practice and still keep it fresh and new by adding in the handwriting. If she did not struggle so much with the phonemic awareness, I believe we could handle an average pace of a lesson per day. For now we'll continue our pace of 2-3 lessons per week so that she builds confidence and gains strength. I would love to see pacing suggestions listed in the Teacher Guide but I did find the FAQ on the website. Because of the phonemic awareness sections, I highly recommend Foundations A. If you have older students ages 7 and up who struggle a bit with reading or spelling or whose skills could use some strengthening, check out the Essentials 2nd Edition program. Essentials also covers grammar. Many members of the Crew reviewed Essentials and some reviewed Foundations A, B, C or D. Click on the Banner to read more reviews of Logic of English. I feel like I abandoned the Random Five on Friday. I miss it. So here are 5 things on this Friday. 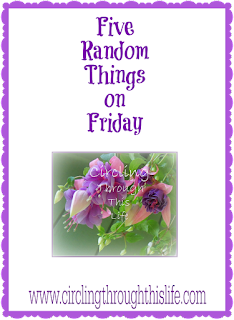 Five on Friday is a name I've seen around so I might change from Random 5 to Five on Friday. Maybe I'll even hunt for a link up! 1. Supergirl has been busy working on some foundational skills in phonemic awareness and handwriting with Foundations A from Logic of English. She's also learning on the sounds of phonograms. So when we learned the sounds of the letter a, we learned all three. Instead of waiting to learn the soft sound of "G" we're learning it at the same that we learn the hard sound /g/ for gate and /j/ for giraffee. I'll be posting a review next week. 2. Tailorbear just celebrated her 17th birthday. Unfortunately, she's been sick and spent her birthday morning at urgent care getting treatment for a severve ear infection. She's quite sick of being sick and today is doing much better. She got a digital drawing tablet that works with her lap top and that's given her something to do when she is not sleeping. 3. Today is the Annunciation. Supergirl asked what was so important about today and I said today is the day that celebrate that the angel Gabriel told Mary she would have a baby. She said "Again??!" Boobear responded with "Yes. We do this every year." I'm not sure why Supergirl kept stating again. Just to be safe, I decided it would be a good idea to make sure she knows that Mary isn't having another baby. 4. 2016 is flying by so fast. If only time would move as slow as it did when I was a little girl. Here we are nearing the of March and the first quarter of the year is gone! Pascha is just about as late as it can be this year so we're just entering Lent. I don't know if that is affecting how I perceive time. The Western Church observes Good Friday today and will Celebrate th Resurrection on Sunday. On Sunday we'll be ending week 2 of Great Lent. 5. I need to do a separate post on what I've been reading. I did just finish Before I Wake by Dee Henderson. I don't think I want to write a whole separate post on that book but I just have to tell somebody, so dear readers, you are the somebody. That book left me unsatisfied. I can't say that I didn't enjoy it. I have read other Dee henderson books so I was excited to read this one, but but but . . . I am hoping it becomes a series because it ended with too many loose ends for me. Have you been using new curriculum in your home school? What books have you read lately? I started using Demme Learning's Math-U-See in April of 2005. No that is not a typo. I switched to Math-U-See because BooBear really struggled with math. We've been using Math-U-See in some way ever since. When I found out that the Schoolhouse Review Crew was given the opportunity to review the brand new Digital Packs, I knew I was going to want to write a review! Since Tailorbear is using Geometry, I chose that for her. Supergirl has been using the Beta Level Digital Pack. Let me start by giving a brief explanation of how Math-U-See works. This home school math curriculum is not grade level based but rather is organized by skill level. It uses a mastery rather than spiral based approach to learning. Students master one concept and then move to the next concept. For Elementary students who are ready for mastery the books are labeled in Greek Alphabet order. Primer is an introduction to math that is perfect for young students ages 4-5 who are not ready for the mastery expectations of Alpha but who want to do school. Yes, other concepts are taught as well so it's not quite as boring as it sounds. Each of the "Greek" levels has 30 lessons. Each lesson has 3 practice pages for the concept taught in that lesson and 3 review pages. The review pages covers material not just from previous lessons but from previous levels as well. Online Drill ~ another fun way to practice math facts! Supergirl still struggles with memorizing her individual math facts but has mastered the concept of adding. We own both Alpha and Beta so I've been combining them so that she continues to work on mastering or memorizing single digit addition and subtraction yet is able to move forward with some new concepts in Beta. Supergirl and I watch the Video instruction together. She loves Mr. Demme and sometimes will watch lessons over and over because she enjoys them. I love having both the DVD and the Streaming video options. She watches the DVD for fun, but for school we use the Digital Pack videos. 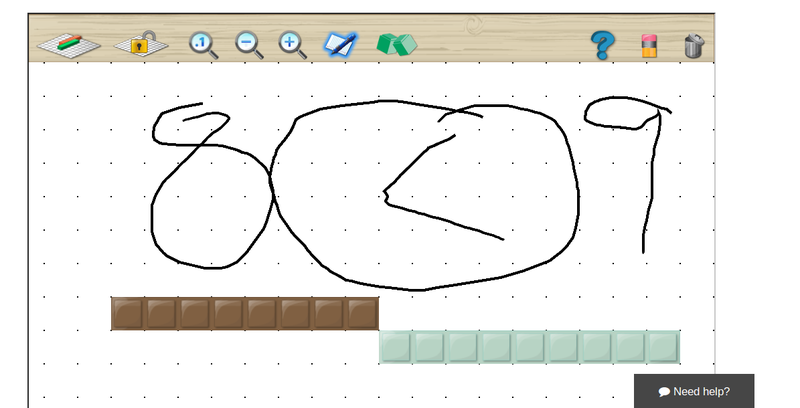 We also have been using both the Digital Manipulatives as well as the physical integer blocks. I love that we can pause the instruction and click on the Digital Manipulatives. They open in a separate tab and we can explore the concept with the Digital Manipulatives without having to haul the physical ones out to the family room or bring the laptop to the dining room. Supergirl does benefit from being able to physically touch and manipulate the blocks so on days that we are not watching the video lesson, we work with the blocks and the worksheets at the dining room table. For her having both options is helping her to really own the concepts and she is having fun while learning math. Geometry covers the topics that you would expect to find in a high school level course. There are no physical manipulatives for this level. 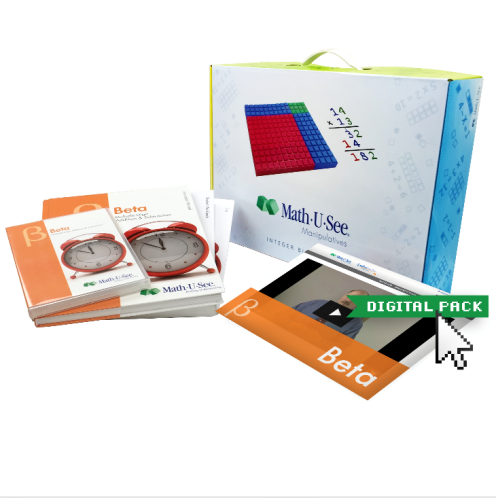 Since the integer blocks, algebra inserts, and fraction overlays are not needed, the Geometry Digital Pack does not include access to the Digital Manipulatives. It does however contain access to the same types of content: streaming videos, lesson summaries, lesson solutions, and test solutions. 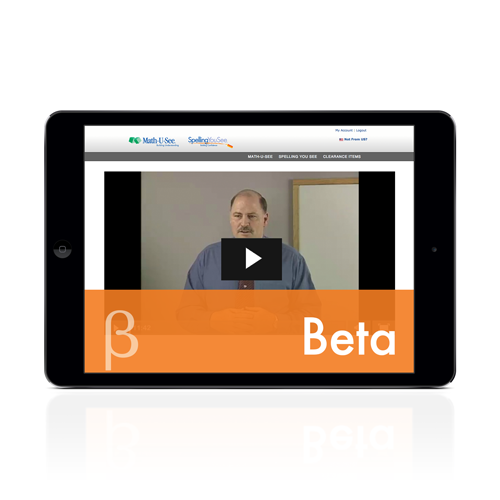 Unlike Beta, Geometry only has two additional resources: the link to the downloadable parent resources and the Geometry Record Keeping Sheet. Tailorbear tells me that she really likes how Mr. Demme breaks down the concepts so that she really understands them. She loves the Record Keeping Sheet and she likes having the option of streaming her Geometry lesson and not being dependent on the DVD. The school laptop doesn’t play DVDs and the family room is often occupied by other students. I think purchasing a set that includes the Digital Pack is a great idea for flexibility for the Geometry Level but I think it is less useful than having the Digital Pack for the Beta Level. The streaming instruction videos plus the Digital Manipulatives complements the physical blocks nicely. 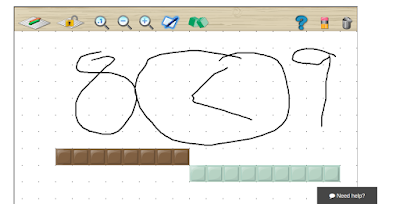 I wouldn’t want to do Beta with just the DIgital Pack as my daughter really needs the tactile aspect of the physical integer blocks but the Digital Pack provides a great tool to use for introducing the concepts. Other Crew members reviewed different levels of Demme Leanring’s Math-U-See. Click on the Banner below to read what they have to say about the Digital Packs! As a Schoolhouse Review Crew Leader, I received multiple levels of the product. All information is correct and accurate at the time of this review. I'm a morning person. Not an early morning, up before dawn, type of morning person but a woman who likes to get up and get going. Mentally I function better in the morning. I have more motivation and I accomplish more between 7am and NOON than any other 5 hour period of the day. 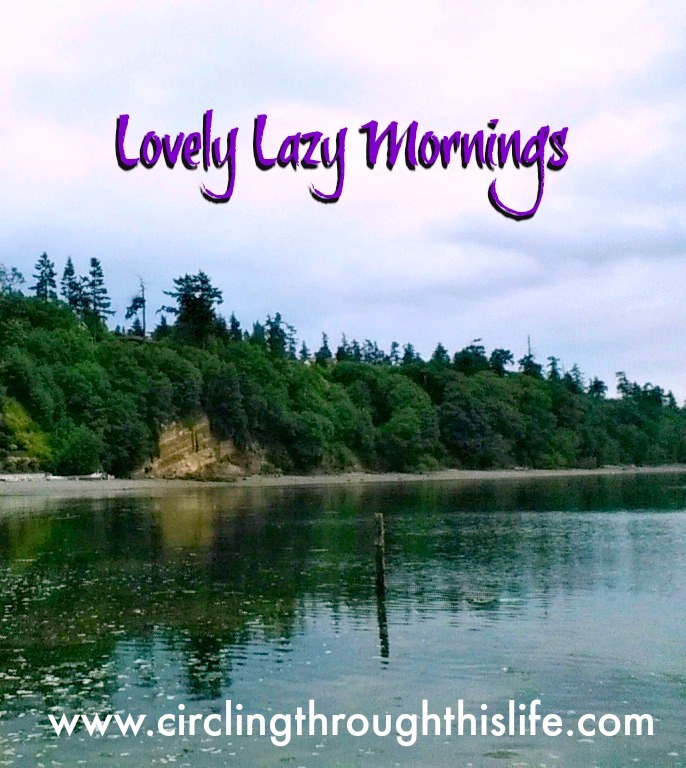 But every now and again, I enjoy a lazy morning. Rather than fight with my family to get them to function on my circadian rhythm I just lay around in bed. But, wait, I don't lay around in bed tossing and turning. I have my Kindle. Just like with my Late Night Reading, I sometimes have Lazy Morning Play on Kindle. Since the Kindle Fire I have is like a tablet, I can do things like check the Schoolhouse Review Crew forum, or my personal and blog emails. I can scroll through my facebook feed. I've been known to play Minion Rush and The Secret Society (a hidden object mystery game). Sometimes though, on some lazy mornings, I spend time chatting with my husband. We lay there still snuggled in covers and talk about our plans for the day or things that have been on our minds. What we don't do is talk business. We don't talk about our to do list or the bills or whatever issues need tending to with children. Rarely, we'll stay in bed late enough that one or two or more of our sleepy head children will come and seek us out. Those times are getting rarer now that they are 20, 18, and soon to be 17. But I cherish the memories of 4 or 5 or even all 6 of us crowding the bed on a Saturday morning just enjoying being together. 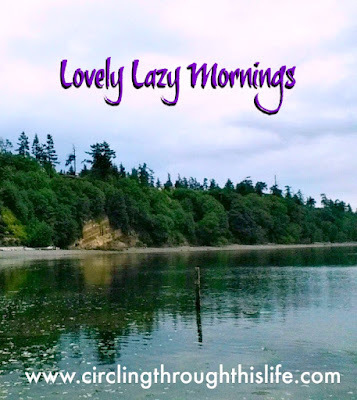 Now that I am a work at home mom, I treasure those mornings, especially on a Saturday, that I can move slower and take time to create special moments.